We want you to get the most out of your online marketing activities and turn more of your website visitors into customers. This is why we think it is so important that we know what your website visitors are doing when they land on your website, and how they interact with it. We don't just drive quality search traffic to your site, we focus on conversion optimisation. Using Google Analytics we can monitor how people interact with your website and as a result optimise PPC and Social campaigns in order to maximise conversions. 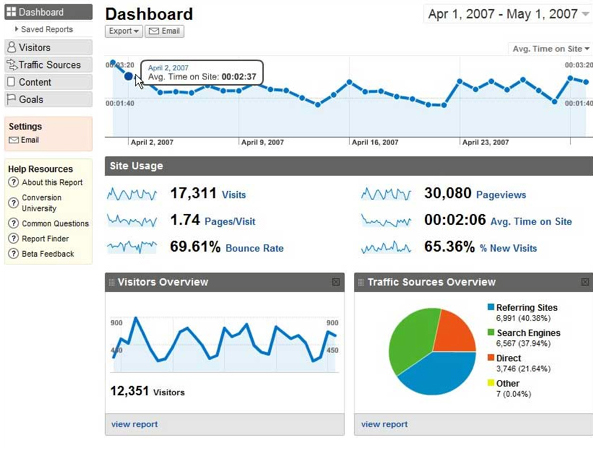 Google Analytics does a lot more than simply report on how many visits your site receives, and where they come from. It also tells you what they do on your site, which p[ages they look at, how long they are on your site and a very important feature is bounce rate. There is so much more to Google web analytics to use in an attempt to improve any web marketing campaign and improve conversions. We also use analytics data to make changes to your website and landing pages where needed to improve the "stickyness" of your site and improve conversion rates. If you don't currently have analytics on your website or do but you do not understand what it all means, contact us and we can provide the training you need. Call 01524 37900 now to learn more about how web analytics can benefit your business, and to find out more about our other digital marketing services.